Many cats do not like the idea of being groomed, and brushing them can become a chore instead of enjoyment. Cats will often groom themselves, but when they become matted they need a helping hand. Matts can reduce the amount of blood flow to the skin and therefore cause the skin to breakdown and become infected. Attempting to brush out these matts can be painful for the cat and cause bruising. The only way to remove matts is to clip them away from the skin. 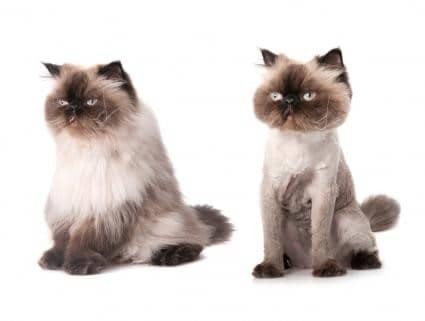 Often long-haired cats have matting issues more often that short haired breeds, including those such as ragdolls and birmans. The outdoor environment is becoming increasingly dirty and therefore coat problems are increasing. Southern Cross Vets offer the lion clip for cats. This is where all the hair is removed from the cat except for the head, the feet and the tail. This ensures that the cat does not become matted, and removes the matts that the cat may already have. It allows us to start grooming from the start. Once lion clipped, owners can start brushing the coat whilst it is short, and therefore reducing matts as the hair grows. Lion clips can also be used as a hygiene clip for cats. Shorter hair ensures that cats stay clean and tidy. It also helps them during the summer months to stay cooler. We normally sedate cats for the lion clip procedure to ensure they stay completely still. This allows us to clip the cat without cutting them or them getting stressed. It also means we can clip nails, and check any other health concerns you may have at the time. If you would like to enquire about having your cat lion clipped then please get in touch with reception!